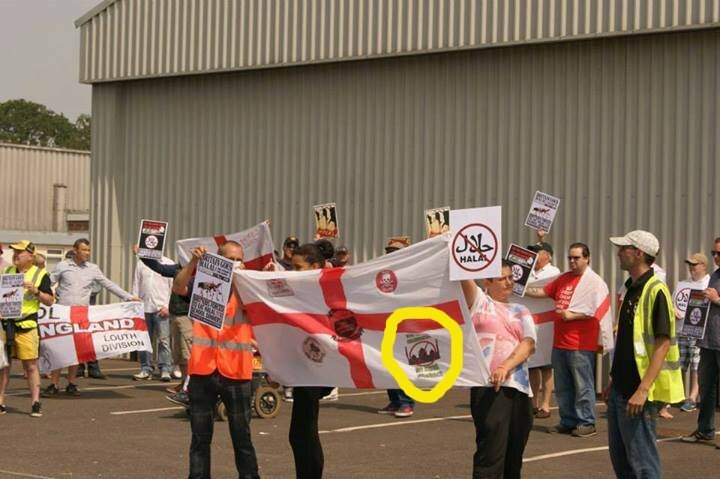 In spite of their hype, the BNP are failing to make progress on the issue of the Skegness halal slaughterhouse. Their last demo was disappointing, turning out only 30 supporters, some of whom were so disappointed with the local organisation that they handed in their membership cards afterwards. Local activists blamed the time of year and lack of advertising for the poor turnout. No such excuses could be blamed for a similarly poor turnout (we counted about 30 in their photoshoot) yesterday. Thanks to the decision of Johnston Press to give the BNP an advert for their demo in the local newspaper, the Skegness Standard, the fascist party had had all the publicity they could hope for. 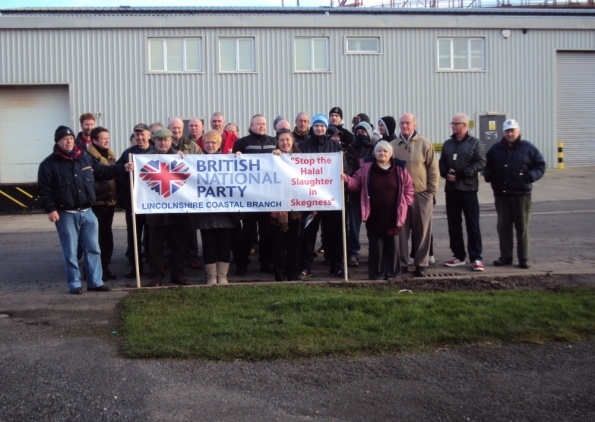 So no progress for the BNP and, given the rumours suggesting that the slaughterhouse is being run into the ground by incompetent owners, the issue could soon be a moot point. Thanks to some constructive dialogue with the editor of the Skegness Standard over his paper’s coverage of the issues, most of the East Midlands Anti-fascists’ statement, telling the truth about the BNP’s fake concern for animals, was published yesterday. Lincolnshire Coastal Branch had better find another issue to exploit fast, because this one is turning into a dead duck. This is inadequate. Would Mr Murray give advertising space to an explicitly Nazi Party? Would that be ordinary business as well? Would he be surprised if there were angry protests against him and his paper if he did so? I imagine he would treat such an approach as either ethically repugnant or bad for business, depending on how cynical he was. 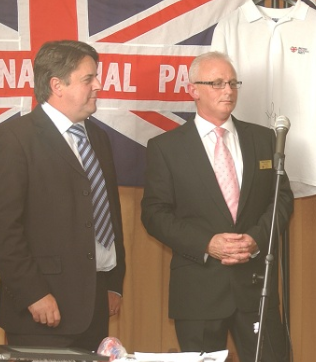 Giving the BNP an advert is not really much different, however legitimate they would like us to believe they are, given the leadership’s strong links to Nazism, anti-Semitism and racial violence. You also ask why we didn’t look to get comment from anti-fascists; it’s simply because we would always look to get reaction from local politicians first because we’re a local newspaper. This avoids the thrust of the question which was why the Skegness Standard gave an uncritical report of the BNP’s protest. 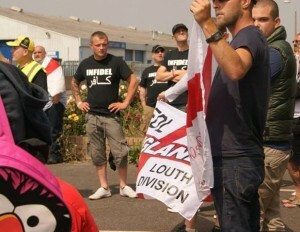 Were there really no “local politicians” who opposed the BNP’s march? It seems unlikely. 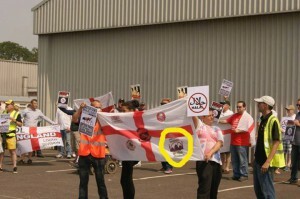 The only person quoted in the Standard’s front page feature on the BNP march was the regional organiser, Robert Ashton. If this isn’t bias it is extremely poor journalism and either way Mr Murray is culpable. The BNP has recently announced that its Lincolnshire Coastal Branch, organised by Grimsby’s Robert Ashton, will be holding another day of action in Skegness next weekend. 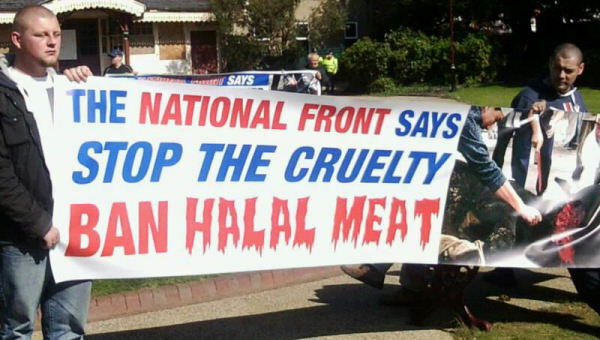 The BNP will be meeting from 11.30am on Sat 16th March, with the intention of marching to the Heath Road halal abattoir. Last time they met at The Victoria, 23 Wainfleet Road. We don’t imagine they will have moved far but you can call them on 07714009285 to find out. They are even taking the party’s Lie Lorry for a spin around the streets – let’s hope that there are no low bridges in Skegness! Party activists will, once again, be crying crocodile tears and pretending to care about animal rights but in reality they are more interested in persecuting Muslims. Interestingly, local paper The Skegness Standard seems to be propping them up, giving the fascists “ground breaking” advertising space for their demo. Readers may remember that after the last BNP demo in January, the Standard gave the BNP a totally uncritical feature article, which will undoubtedly have been a boost for them. Either the people running the paper are totally naive or are sympathetic to the fascists.